I sense something, a presence I have not felt since the Cliff Dwellers. Vader’s helmet certainly resembles a reversed baseball cap (with the blast bill down, how is Troop supposed to fight?). i must have a stormtrooper helmet with an AU logo on the sides. i must. That dude on the far left shoulda sprung for the adult sized helmet! 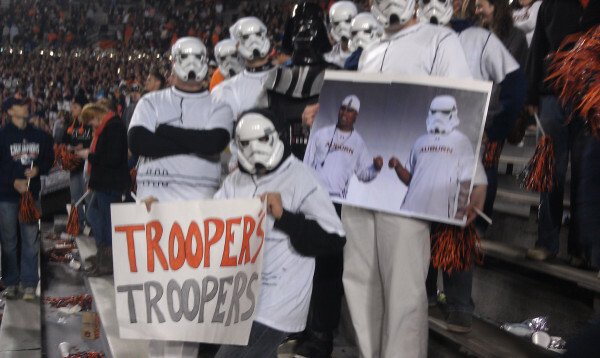 Now if we can get Coach Troop to swing a lightsaber on the sideline instead of a towel the circle will be complete.